To The Depths, In Degradation is the finest album from the sub-strain I like to call Backwoods Brutality Death Metal. Grainy of texture and uniformly joyless in tenor, a coagulation of the darkest proclivities evident in North American death metal from the era, this album throws no bones whatsoever towards the casual listener; technique is pared down in favor of conceptual progression, and accessible melody and groove denigrated as utter anathema. Atmosphere, that much-maligned excuse for a lack of ideas, is super-abundant, but it is realized with an effortlessness that should be the envy of all bands. Death metal may include a wide range of styles based on territory and individual pedigree, but it is hard to think of an album that personifies the term – in theme, sound, and ambition – more than Infester‘s grim classic. Discrete, tenuously related riffsets resembling nothing so much as the shambling gait of the undead form the basis of the Infester sound. Inverted harmonies – ghoulish takes on nursery rhymes – frequently blanket individual songs; a core theme sometimes played on cheap midi synthesizers introduces the germ of an idea; chief notes therein are then rearranged in suitably tangential configurations, so that a palpably fresh melody emerges while still remaining within screaming distance of the original impetus. 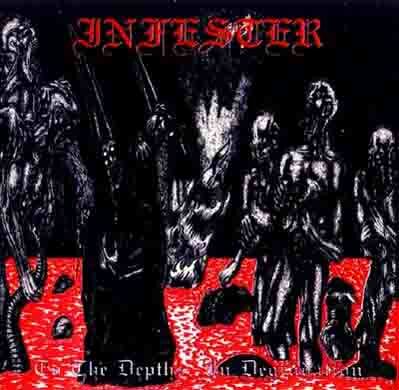 Ever so often, segues within songs consist of seemingly random shards of power chord noise like the splatter of paint on an abstract canvas, but Infester‘s sense of dynamics is classical of aspiration and their vision indivisible. This truly is death metal songwriting from the subconscious, done inside a cocoon, under the influence of substance and self alone, and complete with lulls and bouts of supernatural fury; perhaps unwieldy at times because of the free rein it enjoys, it is hard to imagine this album sounding as unpredictably fecund if it were to be subjected to the rigors of a professional editing job. 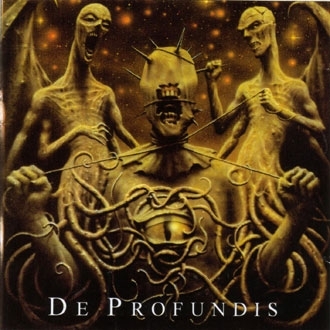 Released at the fag end of death metal’s heyday, De Profundis represents Vader‘s most technical work, and a slight detour from the heavily Slayer-influenced music that preceded and followed in its wake. Crushing like a well-drilled battalion from the wars of the early twentieth century, De Profundis is nearly the polar opposite of its opponent in this match-up; technically accomplished and even showy in the tradition of speed metal, De Profundis, like all Polish death metal, intimidates by force of muscle to be sure, but behind the brawn also lies a cold and calculating intelligence, distilling all excess, and landing a frighteningly direct punch to the face. De Profundis is death metal of impending climaxes unto perpetuity. Everything here builds to critical mass before gratefully emptying its stock of tension. It is a breathless approach to songwriting, allowing no recession in hostilities, and thereby compromising something in the way of subtlety; but not at the price of coherence or indeed progression. Where albums in the near future would be streamlined to near-linearity, De Profundis evolves in rhythmic micro-cycles periodically interrupted by broken-riff sequences after the manner of Sinister; Vader adopted the circular style of riff-writing established by Morbid Angel on Covenant; under iteration, the nature of that style creates the impression of a lyrical groove, which then transmits its energy to the next component in the song’s chain, creating a domino effect of ever-increasing momentum. To The Depths, In Degradation does not hold a candle to De Profundis in the performance sweepstakes. Nor is it necessarily better-written from a sterile analytical perspective. But with due credit to Vader, To The Depths, In Degradation exists in an altogether deadlier – and, paradoxically enough, evocative – paradigm, and perhaps even compels a further reconciliation between the phenomenal and the transcendent in death metal. This entry was posted in Death Metal, Death Metal Battle Royale and tagged De Profundis, Death Metal Battle Royale, In Degradation, Infester, To the Depths, Vader. Bookmark the permalink.